A good deal on Hotwire landed The Astronomer, June, and me at Parc 55 during our San Francisco stay. As luck would have it, Michelin-starred Thai restaurant Kin Khao was located on the ground floor of the property. On our first night in town, we met up with a few old friends for dinner here. It’s not every day that the most convenient dining option also happens to be the most interesting one. The woman behind the highly-lauded restaurant is Pim Techamuanvivit, a former food blogger turned restaurant proprietor. The menu celebrates the bold flavors she grew up eating in Bangkok using California’s finest produce and proteins. To start, we shared the Mushroom Hor Mok Terrine ($14). 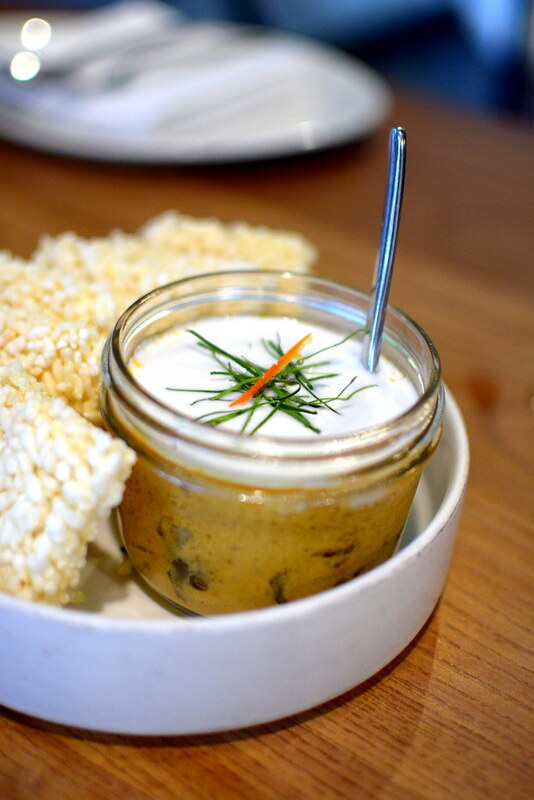 The curry mousse “in-a-jar” was brimming with mushrooms and served with crispy rice cakes on the side. The two mushroom-loathers at the table nevertheless found it enjoyable, while the mushroom-lovers adored it at first bite. 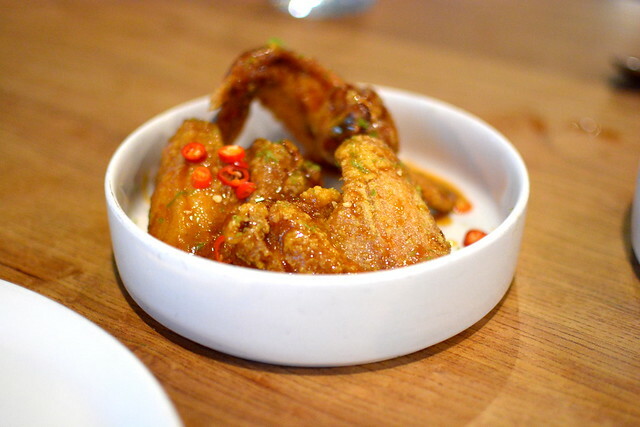 We also split an order of the Pretty Hot Wings ($13), which were manageably spicy with their fish sauce-garlic marinade and tamarind-Sriracha glaze. Nice fry, nice sauce, nice wings. The only dish on the menu that wasn’t spicy (a.k.a. toddler-friendly) according to our waiter was the Caramelized Pork Belly ($22). 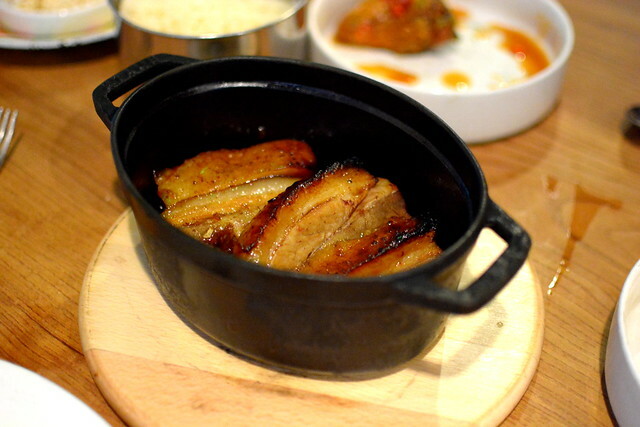 Cooked in a clay pot, the pork was exactly as described on the menu: “Sweet, savory, voluptuous.” Accurate menu descriptions must be one of the perks of having a food writer at the helm. 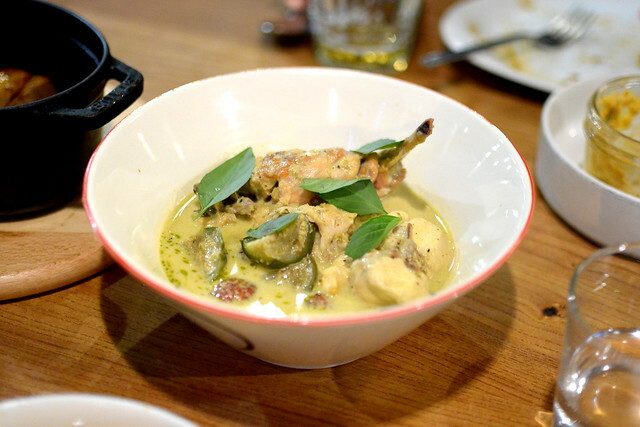 And then there was Khun Yai’s Rabbit Green Curry ($35), a lovely coconut milk-kissed green curry complete with rabbit leg, rabbit saddle, rabbit meatballs, apple eggplants, and Thai basil. Truth be told, I was taken aback by the price tag on this one. While it wasn’t head and shoulders above comparable curries in taste, I can respect that the steeper cost contributed to a humane life for not only the rabbit, but for the entire ecosystem that brought the rabbit to our table. 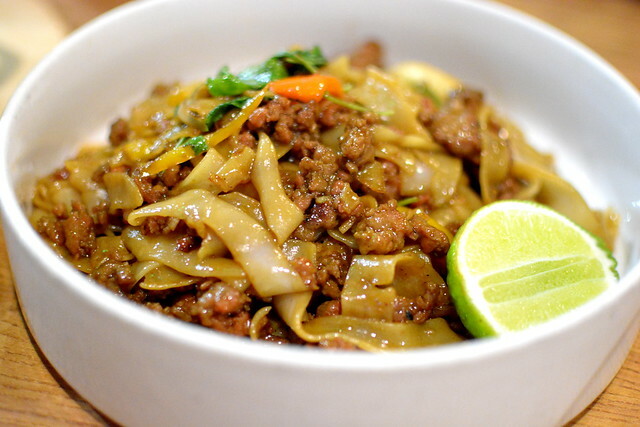 Finally, a most comforting and homey bowl of pad kee mao ($18), a spicy drunken stir-fry of rice noodles with ground pork, garlic, bird’s eye chili, onions, bell peppers, and holy basil. A squeeze of fresh lime juice was a must. 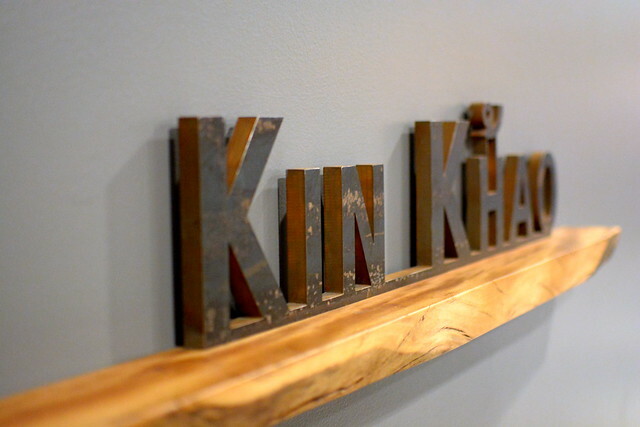 Everyone at the table agreed that the food at Kin Khao was very good this evening—careful cooking and excellent flavors. June was too tired for dessert, so we returned the next day for a taste of the “Thai Tea Soft Serve” ($12) served with tapioca, condensed milk, and toasted coconut. It hit the spot… 24-hours later. You eat with mushroom-loathers? Who knew? LOL, Paul. I’m good with mushroom-loathers because that means more ‘shrooms for me!